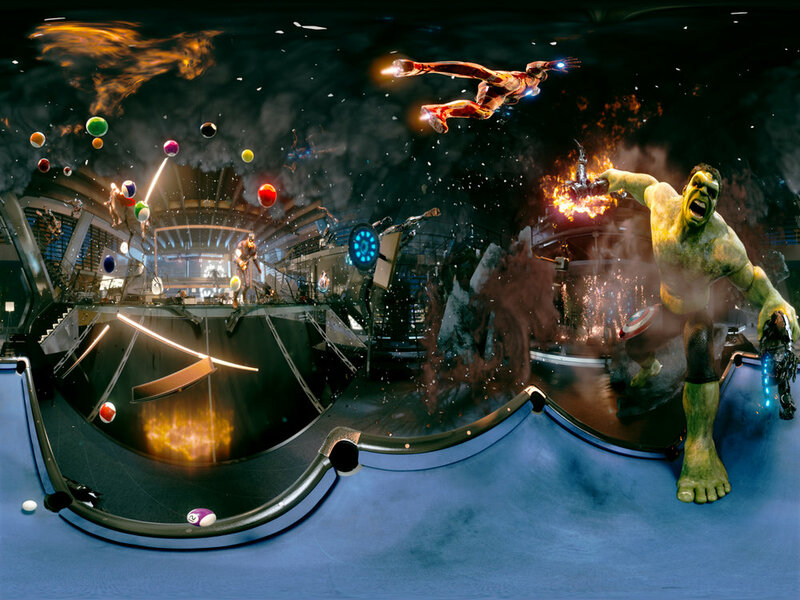 A Virtual Reality experience that thrusts you into the heart of an action-packed Avengers showdown. 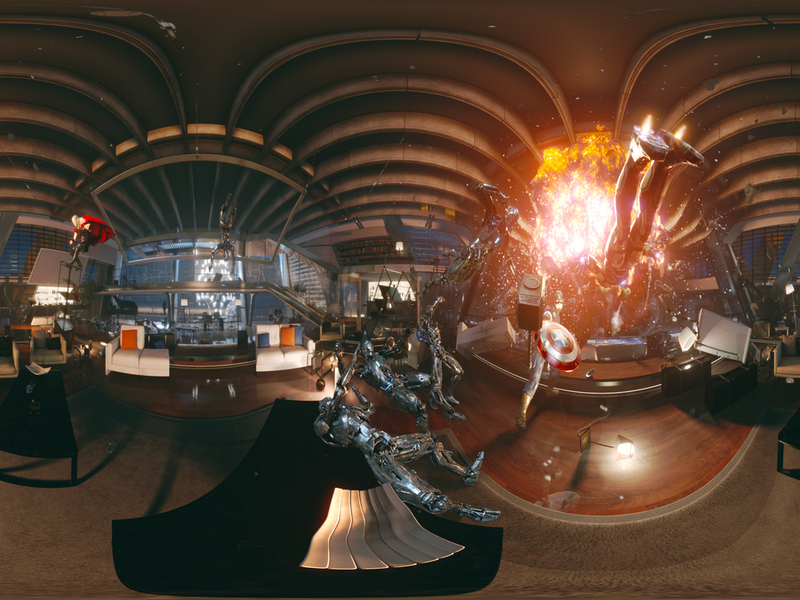 What if you could put on a Virtual Reality headset and transform into an Avenger? Our gauntlet was to combine the feeling of embodying Iron Man with the experience of being present in Avengers Tower during an Ultron attack. And to make this truly immersive filmic experience come to life on a smartphone. We worked to create a cross platform campaign for The Avengers: Age of Ultron premiere and the launch of the Samsung S6 phone. We are no stranger to cinema-quality rendering; the unique challenge was to bring our world-class visuals to the Gear VR mobile platform. For Marvel fans, the dream is to be one of the team in the middle of the action, with all the heroes standing beside you. An incredibly innovative approach was needed for a Virtual Reality experience where fans really become one of the heroes in a battle and help save the world. The solution was to open with an epic real time rendering, fully interactive environment and then transition to a stunning pre-rendered 360 video. The battle begins in Stark’s penthouse. The reflection in the window reveals that the user is Iron Man. The game-engine maps the suit’s movement to the user’s - immediately creating unforgettable immersion. A heads-up display, visually informed by interfaces from the film series, guides the user around the space. As the user directs their gaze at various objects, scanners reveal wireframe overlays and descriptive data. This is a world powered by Stark Industries. Suddenly, tranquility is shattered: Ultron Prime and his Sub-Ultron foot soldiers attack. Time slows to dramatic bullet-speed. The user skims through the ensuing mayhem, passing explosions and attacking Sub-Ultrons, flying by Thor throwing his hammer, Captain America battling three Sub-Ultrons, and the Hulk as he simultaneously breaks Stark’s pool table and rips an assailant in half. The slow motion illuminates everything in glorious 2K resolution. The pre-rendered video is 360 degrees of top-quality cinematic CG. The smoke clears, the missiles track in, and the Sub-Ultrons part to reveal Ultron Prime himself. The end result is a fully immersive, interactive, feature film-quality VR experience with true binaural sound. With so much going on, it was critical to consider the user journey from the opening moments to the battle crescendo. "It was important to give each character enough screen time and action for us to inhabit their world, but then use something else to make the viewer change their gaze to a different hero", explained the director. "We found flying weapons and rocket trails really helped." One of the biggest technical obstacles on the job was the rendering time for spherical 3D video. “We essentially created 90 seconds of film in 360 degrees, in 3D, in under two months", explains the Executive Producer. It still took three days to render the epic environment for this project. The Holy Grail of any VR experience is a true feeling of presence. In the Battle for Avengers Tower, fans were blown away by how real the world felt. They were Iron Man and Ultron Prime was a true threat. People ducked, dodged and cowered. Hands reached out to touch and grab. There was lots of screaming and breathless moments. The worldwide audience was quick to share their excitement all over the web through pictures, video, and lots of social chatter. People all over the world were able to experience what it is like to be Ironman and experience the Battle for Avengers Tower firsthand. With millions of views on Youtube and countless app downloads, the excitement of the VR battle spread like wildfire.